Now it’s payback time because Ray had invited me to guest post on his blog “Wok with Ray“. Initially he thought that his comments had paid off, well actually it’s the other way around my comments to his blog are the ones paying off as I was finally invited by one of the most known Filipino food blogger in the States. When I received his invitation I was stoked and very honoured to be a part of his site, I was tasked to post either a pride dish from in the Philippines, a family favourite or a very memorable dish. Initially it was a hard choice because Ray’s post and my post combined is already an encyclopaedia of Filipino dishes. Having said that I can’t think of something Filipino that we both haven’t posted yet so I was left with the two options and chose a family favourite. So let’s go ahead with our recipe for today, we will be making some Vietnamese. For the full story and recipe please view my guest post @ Wok with Ray or continue below. Looks really delish. Recipe please. Head over to Wok With Ray, the link below. Stunning photography as always. The light is gorgeous, the styling is wonderful and colours are beautiful. No doubt a tasty delicious and satisfying meal. Cool photos! The Pho Ga looks really good and yummy! I am craving noodles! What a beautiful dish and gorgeous photo! Great looking dish! I’m on my way to Ray’s right now to read all about it! This is sure a great guest post..
Um – super yum! Off to read the guest post! Congrats Raymund. 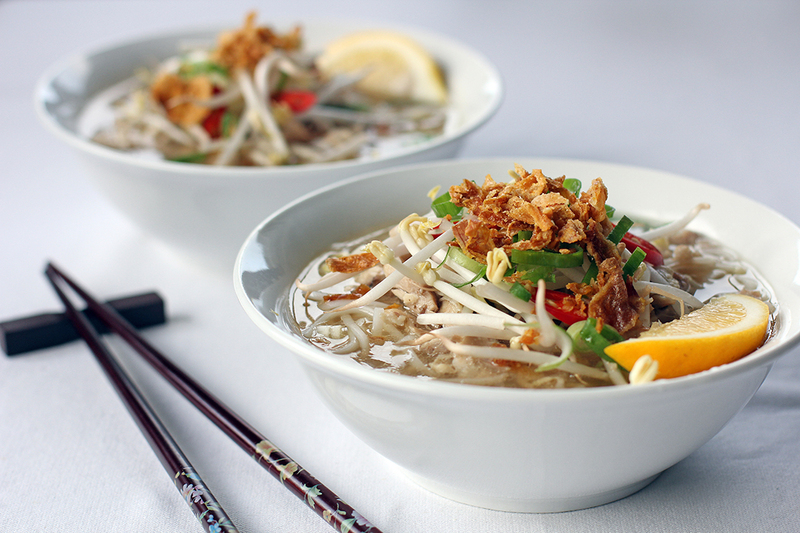 What a great looking soup that is and being a huge Pho Bo lover I’m, off to check out your recipe for the (chicken?) version? Beautiful pic and this sounds DELICIOUS! I’ll have to sub in shirataki tofu noodles, but I think I can do this one! I look forward to making it. Though completely different ingredients, this looks a lot like indonesian saoto soup. I eat it every week and love it! This is my go to Pho/Chicken Soup Recipe. 🙂 It’s really good since I don’t like the beef in regular Pho.